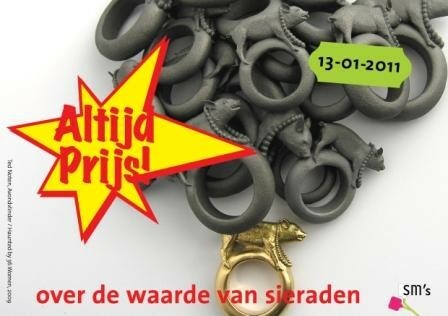 Last month the Museum for Contemporary Art and Design (Stedelijk Museum ‘s-Hertochenbosch, “SM’s“) organized a symposium on the value of jewellery. Experts from different fields (artist, gallery owners, appraisers, jewellers such as myself, and scientists) discussed their views and the different aspects of the value of (modern) jewellery; emotional value, material value, whether it is fashionable or a big brand, the different settings, whether it is considered Art or not). Suzanne Monkel gave an interesting introduction, in which she mentioned a range of different value related aspects. There were very interesting discussions about Art, emancipation of women and jewellery but no conclusions. In fact, there where huge differences of opinion between the different circuits, which all have their own system of pricing and defining quality. A much heard saying about ‘what its worth’ was: ‘What a crazy man will spend on it’ (Wat een gek ervoor geeft). Big concern that was mentioned is that nobody really understands why modern jewellery and other applied works of art do not bring in the same amount of money that visual art does. Why is jewellery not emancipated as a fully artistic medium, meaning, why does it not have the same financial recognition? Ted Noten’s acrylic bags will bring 10k at auction while Damien Hirst’s installations fetch 12 million. Most of us found this quite incomprehensible. They make very similar work on a different scale. Common opinion was also that more education is needed in regard to modern jewellery, so people are more familiar with it and recognize styles and designers. Chi ha paura…? (Italian for ‘Who is afraid of…?’, ‘CHP‘) is a brand that produces designer jewellery from international designers. CHP wants to show the world of design that a good piece of jewellery is more than an accessory. Conceptual jewellery design in which the choice of material and technology are used to support the concept. CHP tries to make designer jewellery more accessible and to brand it better. CHP was created by designer Gijs Bakker and Italian gallery owner Marijke Vallanzasca, who asked well-established designers to concentrate more on the preciousness of the idea rather than on the intrinsic value of the object by paying particular attention to concept, play, new techniques and material. SM’s exhibits CHP jewels from its own collection in different themes, such as: What’s Luxury?, Sense of Wonder, Rituals and Body Stories. These are the Gold Nuggets by Chris Kabel. 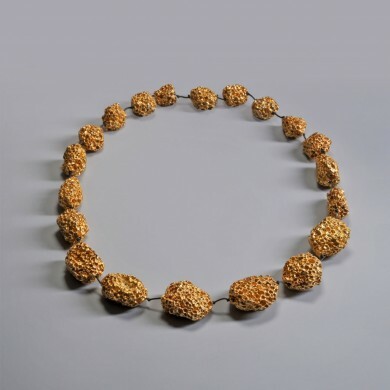 It is a super-lightweight necklace composed of 20 large 24-carat gold nuggets or actually gold-plated silver nuggets questioning the connection between weight and value. It is one of the jewels available at CHP from the What’s Luxury collection; contemporary interpretations of luxury offering new views on man’s desire of luxury. All with a temporary character that just pleases the senses or mind for a moment, like Tobias Wong‘s anti consumerism work. Chris Kabel reconfigures existing objects and materials. Form and function are separated so that his work tricks you, what you see is not what you get, like the nuggets. I really love the surprise of the necklace. It got me smiling ear to ear… The price is EUR 1750,- so in good CHP principles the value of the jewel cannot be determined by its intrinsic value based on its weight of the silver, because it is art and art transcends all matter. How do you like this Gold Nugget necklace? There are 15 nuggets of high carat gold and a bit of matrix metal such as ironstone that weigh 101 grams together, with a larger nugget as a pendant measuring 4 x 3 cm. It was created in the 19th century most likely in Australia. 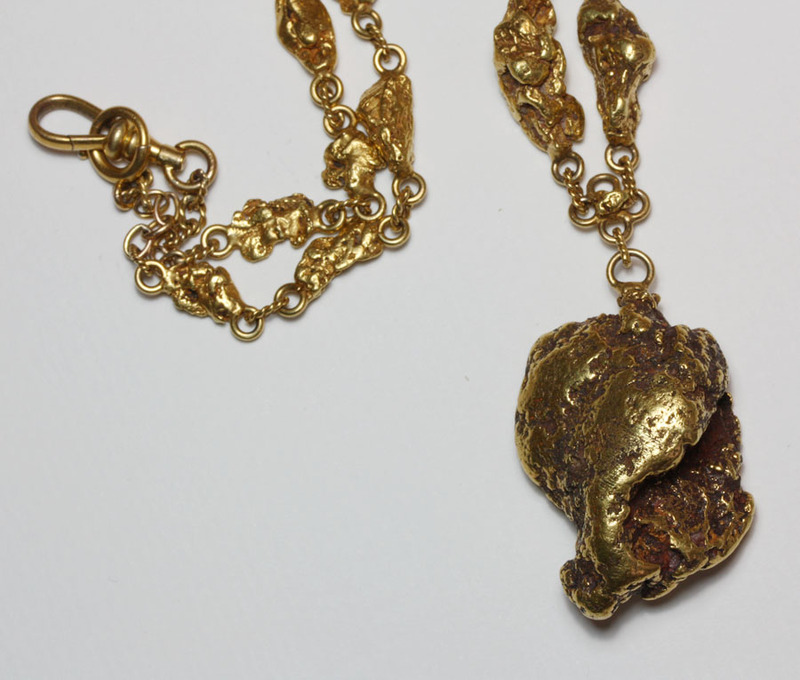 A gold nugget is a naturally occurring piece of native gold. They are often formed in streams and rivers where small particles of gold are welded together by the pressure of the water. These nuggets were found in the ground because they contain ironstone. This is the most common type as the result of chemical weathering and deposition. These nuggets are high purity as they form very close to the surface of the earth, and the ironstone erodes out of them. They often have lots of character, in that they are knobbly with convex and concave facets. Some have reddish ironstone like the big nugget, most have black. Now what is its value? Is only its intrinsic value important for the value of the necklace or is there more? Big nuggets are rare and sought after by collectors. But the rarity of the big nugget is only relative too. Collectors see too much trace elements and maybe melt down the piece. Also collectors would find it a gotspe to put a bail on an important gold nugget, they will completely lose interest, while jewellery lovers will get enthusiastic only when the nugget is wearable. This contradiction also means that rare as it is, little large nuggets like this still exist; being uncollectible they would have been melted down were it not for the jeweler who made this fantastic necklace. Plus, as we have learned, it is all in the eye of the beholder. The price is still under evaluation….